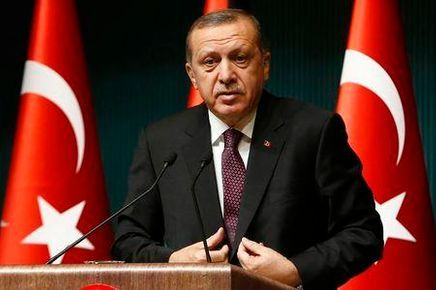 ANKARA (Reuters) - Turkish President Tayyip Erdogan on Friday warned of a "clash of civilizations" following the wake of the Islamist militant attacks in Paris and he also appeared to criticize France for allowing the wife of one of the gunmen to travel via Turkey to Syria. Erdogan, a devout Sunni Muslim, has already accused the West of hypocrisy after the attacks last week in which the gunmen killed 17, including 12 at the offices of the satirical magazine, Charlie Hebdo. The three gunmen were also killed. Speaking at a businessmen's meeting in the capital Ankara, Erdogan said Charlie Hebdo was known for its provocative publications. "We are following with great concern the attacks against Islam hidden behind the attack on the satirical magazine in France," said Erdogan, who has become an increasingly vocal critic of what he sees as mounting Islamaphobia in the West. "Despite all our efforts to prevent it, the clash of civilizations thesis is being brought to life." Charlie Hebdo has published numerous cartoons mocking religious figures including Jesus, Pope Frances and the Prophet Mohammad. Its first edition since the attacks depicted the Prophet, provoking renewed outrage amongst some Muslims. Erdogan said the decision to print millions of copies of the magazine had nothing to do with freedom of expression and was instead "terrorizing the freedom of others". A Turkish newspaper which reproduced part of the magazine is currently being investigated by prosecutors. Without giving names, Erdogan also appeared to take aim at the French authorities for allowing Hayat Boumeddiene, the wife of one of the gunmen, to travel to Turkey in the days before the attacks. She is now thought to be in Syria. "They are talking about people who go through Turkey, but they should first learn how to check passports when these people are leaving their own country," Erdogan said. Turkey has tightened its border security after facing criticism for allowing hundreds of European would-be militants transit into neighboring Syria to join up with radical groups, including Islamic State. A French official said this week that intelligence co-operation between Paris and Ankara was strong and emphasized that Turkey was not at fault for not picking up Boumeddiene. "This is not and should not become an issue, because there's lots still to do, there's other people that we need to track. We're not blaming Turkey at all," the official told Reuters.